Nothing like a legislative issue of personal concern (the potential huge cuts to higher education) to help me become even more aware than usual in the Florida legislative process. I know how to find a legislator by district or zip code. 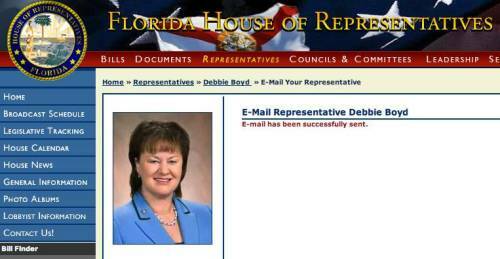 I’ve seen how the House Web site has a built-in option for sending an e-mail to a legislator. I’ve received a range of responses from my e-mails — an automated response within minutes, a personal response within hours by an administrative staff member, and a personal response from the representative himself.